Beverly A. Pekala is the principal of The Law Offices of Beverly A. Pekala PC, a family law firm located in the Courthouse District of Chicago, Cook County, Illinois. She is a nationally recognized expert in divorce and family law, including pre-and post-divorce, custody, child support, maintenance, retirement benefits, pensions, parentage, separation, visitation, prenuptial agreements, business valuation, tax and financial settlements. 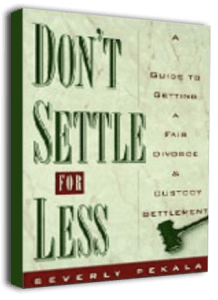 She is the author of the best selling book “Don’t Settle For Less” (Doubleday), which provides guidance on divorce, custody settlements and understanding the courtroom and litigation process. Her next book will be published and available for purchase soon.